I have a 2006 Honda Shadow 750, My first bike! I am 58 and my brother taught me to ride last fall. I was so excited to be learning something new I forgot to breathe. Now after being a "seasoned" rider of 4 months the thrill still has not worn off. My only problem is finding someone to ride with, so nice days in Minnesota I ride my bike to work. My dream is to ride around Europe on one. I'm glad I found this site, I was looking for an answer to "helmet hair" as well. Is there a chapter of Women on Wheels or Women in the Wind in your area. Check on line to see if there is a group that you can ride with. 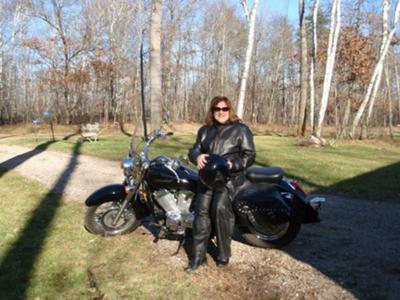 I am sure there is a chapter of Women on Wheels in MN not sure if they are near your area. Helmet hair , I am growing mine out and it seems I can at least put it up with a clip after I ride and also have a hat along with me. It is a challenge. I wear a buff under my helmet and it helps. Looks good as a scarf when I take it off. Check out the buff sites on line. That's a good one. I now wear a do-rag under my helmet, which helps with the itchy when it's hot and carry a hat. It's getting longer so that will help. Have fun riding.